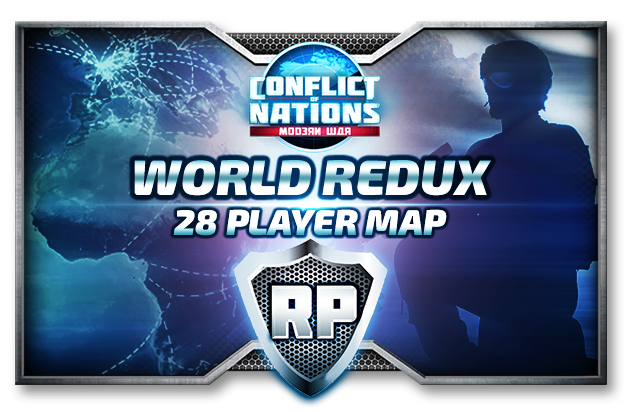 For today's update we are very happy to announce that we have a brand new Global map: World Redux. This comes after popular demand, and we are happy to provide our dedicated players with the opportunity to create and play on this map which will provide some heated combat, so it is best you keep your wits about you. We are aware that some of you have been experiencing technical issues over the past two weeks, and we are continuously working hard to increase performance across all platforms. A big thank you to everyone who assisted us by reporting these issues, today's update is heavily focused on fixes to the back-end. The post was edited 1 time, last by Yak ( May 30th 2018, 3:55pm ). bad (for aircrafts), now they will heal slower. bad, now they will heal slower. Now I'm gonna need another replacement squadron..
Nice to see the new map up and reducing alliance spam will help. Still would like to see some improvements to Alliance Communication (Message all members) and Alliance game administration (replacing inactive & assigning countries). Ranking system is also a sore spot. Soon you can revolt - on the new Middle East map we are planning to have playable Caliphate State aka ISIS. Testing internally currently. Ranking System is being currently attacked from two sides: We just infused Rank Numbers to show the actual real rank of a player. Secondly we are currently working on making them near realtime. Small update to let you know that maps with RP labels will be generated from time to time. These maps are generated with the intention to attract all players who are inclined to roleplay and actively participate in diplomatic and military relations. This does not excuse people to break the rules in pursuit of roleplay, the rules still apply to these games regardless of who or what you are roleplaying as. These games will prove to be very fun and entertaining, so take the opportunity whilst the games are available! The post was edited 1 time, last by Yak ( May 31st 2018, 7:15pm ). is this only the english server? Only English - you can simply join it though by switching your client to English. Then you will see it if not already full. They spawn at 17:00 CET and 20:00 CET. I love the nerf on Africas total points but for the rest i do not like redux at all I find players starting to far apart and to many neutral countries which can be steamrolled to easely. 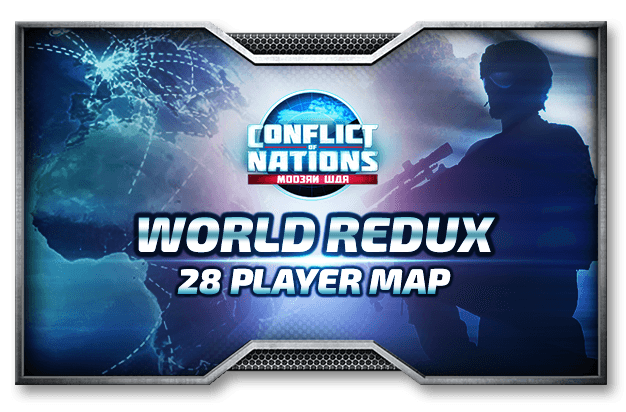 I think a good map should aim to be in between the 64 player world map and the redux map, also the extra starting units (artillery and aa) arent necessary. but that is my opinion of it. 3) one more in Africa... Ethiopia? 4) one more in Asia or Pacific - Afghanistan or Thailand/Burma? The post was edited 1 time, last by Germanico ( Jun 4th 2018, 9:54pm ). definitely no new country in Europe, its already crowded there and has a much greater economic importance than N.America or Asia! To give Asia more importance, Philippines/Pakistan/Myanmar/Aghanistan? Korea would fit perfectly to hold off Japan, so Japan isnt going 100% against China, though that Korea must be quite big to have a chance to hold off Japan. Its not really about nations missing its more that it has huge gaps of space. Also the modern starting equipment prevents pvp until day 5 which leads to imbalances because not being able to war at start is a real nerf to nations who do not have 9-10 or more starting cities. For example in redux countries like China russia, usa and brazil are stronger than on the 64 map due to the space and defense that leaves a country like mexico unplayable because it starts with 6 cities and can only has a small chance when canada decides to team up with mexico and make an combined attack on the usa, if not, the usa gets more resources every day due to the fact it has 10 core cities and only 2 neighbors who have alot less cities. The reason why russia / china / india are not overpowered in the 64 map is because they border 2 many nations. if russia wants to roll in europe it is really easy for japan to slice off a good peace of russia and there is little russia can do about it. Dunno I talked about the africa problem b4 but i do so Romania win alot to because if you are not an island you can expand faster. Dunno maybe you should create a bot and simulate 10.000 wars to see which countries are winning to much ( i know this is alot of work and probably not worth it) . As for redux I only have 5 days of experience on it but it is all so simplified naval countries have a lot less options due to the removal of a lot of parts and the first 5-8 days of redux will always be more or less the same there arent that many options to alternative strategies, on the other hand many people will like it because it simplifies play so they only need to build planes + mobile infantry or national guards and steamroll the map. Maybe the key is having the 64 map with every playable country having the same amount of core cities, which is not realistic, but balanced and remove a few cities in africa and eastern europe. split stuff up into zones/continents and make sure that 1 zone is no more than 1000 vp based on city level 6 and from there calculate what someone needs to conquer to obtain 1750 vp and see if that is good enough for an endgame. The usa for example needs mexico + almost entire south america to win when i play a powerhouse I can get 18xx pts in 39 days. If i play japan i need 4x days most of my games because I loose time on navy. When I played as south africa i had 18XX points in 34 days while I lost my capitol and mexico was gassing me with stealth bombers. compared to the content of this game I think it should last 60 days at least but point is that the 3 type of countries I played should all take about the same amount of days to get the vp to win travel wise. Japan indonesia australia philipines will always need 10 days more due to traveling the ocean and to do that they need to research naval technologies which cost them to be weaker in either artillery, air force, ground troops. Which means that those countries always fight uphill battles compared to land massed nations. But the USA is overpowered because it, unlike china and Russia does not border any competition and its a very long sea ride for another powerhouse to attack it, far in the game you can build carriers, which are cool but due to the fact usa has many resources the usa airforce will always build up a lot faster and stronger then carriers. You do realize we are not optimizing our maps for total equal gameplay... In the contrary: Some nations are harder to play than others or cater to a different play style. And why should the "modern" starting equipment prevent pvp? The contrary actually is the case - you need to invest cleverly and consider and negotiate to understand where your enemy is doing what - and then strike. Nations with many cities are in reality often the nations with the biggest setback: vast space and time needed to reinforce / get to the combat zone. In your observations you bring up many "ifs": "if canada and mexico..." "if russia wants to..." and they actually point at options in the strategies available. They are a possibilities - but not necessities. And that is a good thing. Of course a nation facing two others early on will have a problem... but it may overcome them with intelligent game play (I will never forget Opulon whipping two of our invading devs in one of the legendary dev matches). Regarding naval play I unfortunately have to disagree with you. By removing the harbors naval nations now have a real benefit - being that most players do not invest into marines or the like and safety from easy conquest. I am actually playing a naval nation myself on the new map and it's loads more fun than previously due to me having the benefit of free movement and invasion. Summarizing: the difference between CON and eg. a typical RTS game is that we specifically are not about symmetrical balance from a game mechanical point of view. We deliberately create nations which are harder or easier to play or different in approach. It's part of the game planned design of the game. Good players overcome these odds and win - nonetheless. It's part of the meta. It's not fair - but then, war never is. @Yak what happens after the final warning? I can speak like Crang ! I am speaking like Crang right now ! Can anybody else speak like Crang !